Bravo, bravo, bravo. That about sums it up. Absolutely, bravo. Now, imagine a bunch of clapping and jumping up and down. You may start to get a glimpse of the picture. This is the perfect dish for a hot summer night if you can stand the heat of the grill. 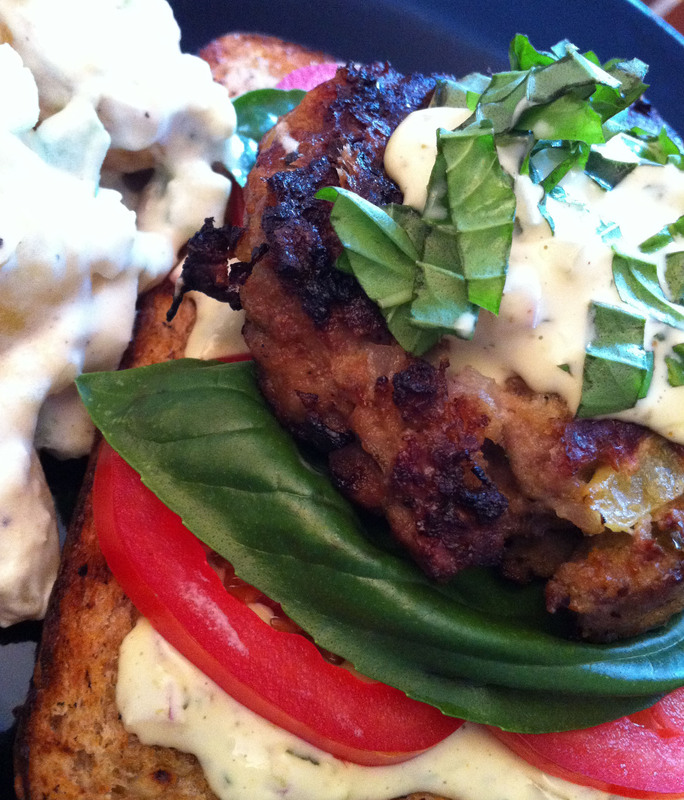 Flavorful, fresh and healthy, the basil complements the turkey burger and tomatoes perfectly. A literal masterpiece! One taste of the basil mayonnaise and I was conjuring up dreams of additional applications- as a dipping sauce for veggies, slathered on steak, tucked into a falafel. 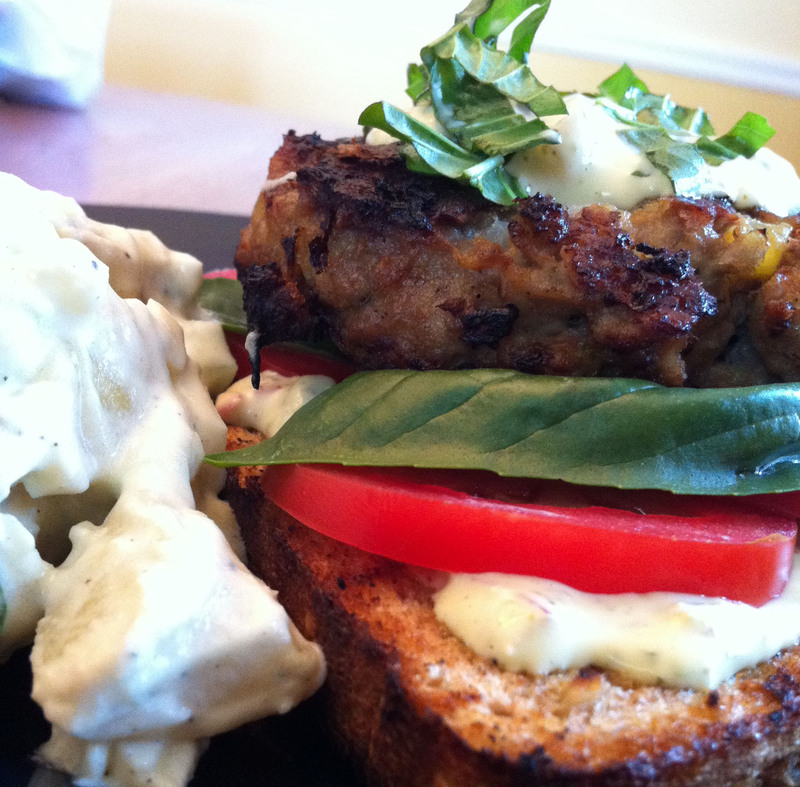 Jon paired the burgers with a Celery and Potato salad that packs a punch. Mmm mmm mmm. Again, simply bravo. Brush grill with oil; prepare barbecue (medium heat). Mix mayonnaise, 1 tablespoon pesto, dill pickle, brine, and onions in small bowl. Season basil mayonnaise with salt and pepper. Mix turkey and 1/2 cup basil mayonnaise in large bowl. 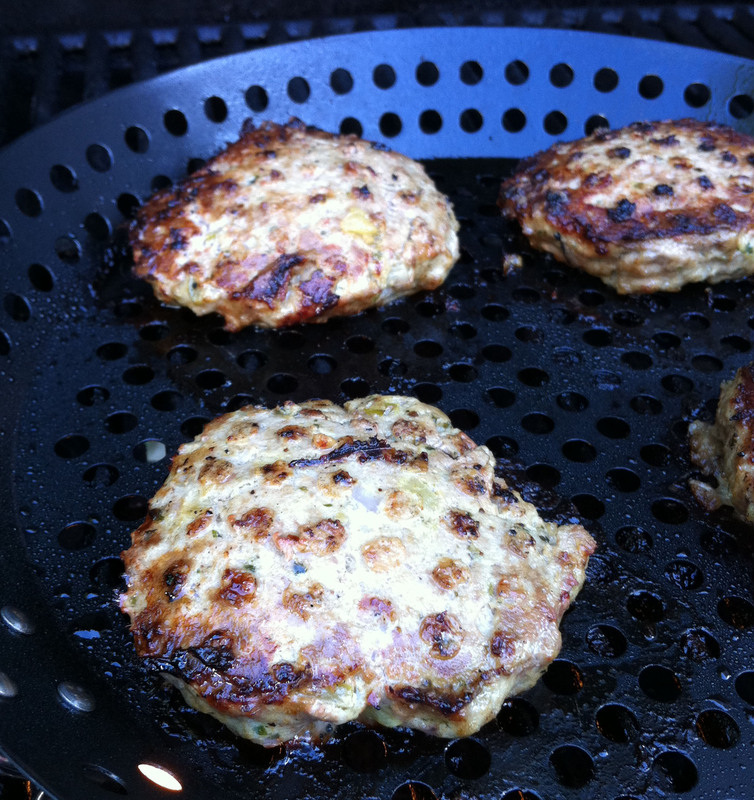 Using wet hands, shape chicken mixture into four 1/2-inch-thick patties. Sprinkle with salt and pepper. Brush bread with oil. Grill bread until crisp and golden, about 1 minute per side. Transfer bread to plates. 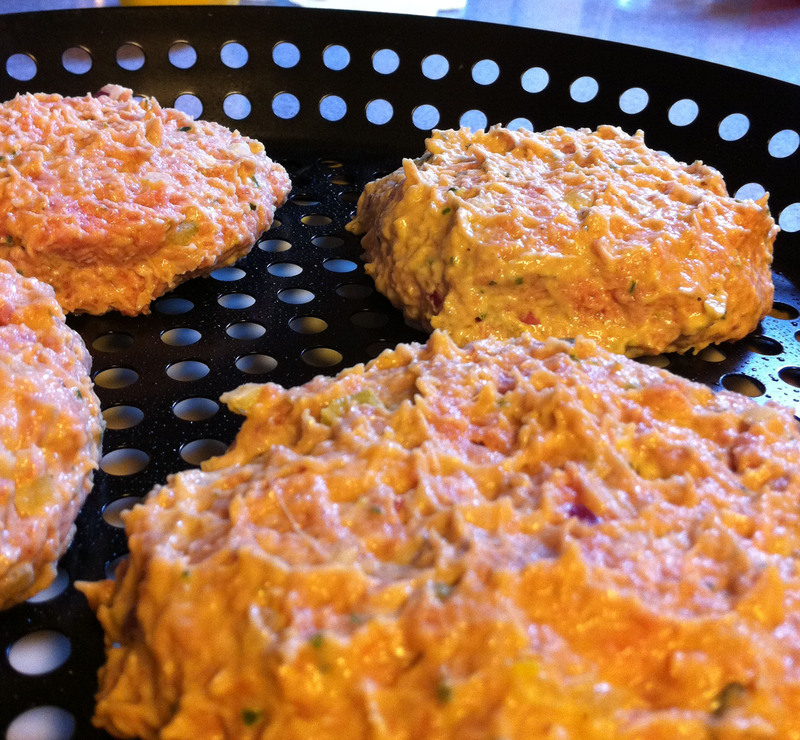 Grill burgers until firm to touch and cooked through, about 5 minutes per side. *We grilled them on an open grill. Spread bread slices thickly with basil mayonnaise. Top each bread slice with tomato, 2 basil leaves, burger, and dollop of basil mayonnaise. Garnish with remaining chopped basil. Generously cover potatoes and eggs with cold water in a 4-quart pot with 1/2 tablespoon salt and bring to a boil, covered. Uncover and boil 10 minutes. Transfer eggs with a slotted spoon to a bowl of cold water; continue to cook potatoes until tender, 5 minutes more. While potatoes cook, whisk together 1/4 cup of vinegar and 1/2 teaspoon salt in a large bowl. Drain potatoes and rinse with cold water until they have cooled to warm. Cut potatoes (skin on) into 1-inch pieces. Toss with vinegar mixture. Peel eggs and coarsely chop, then add to potatoes along with remaining ingredients, including additional 2 tablespoons of vinegar, and salt and pepper to taste. Toss well.